It’s been a few days now. Nothing on me hurts anymore. My legs still feel tired, but not bruised. I am not going to lose any toenails. One of the things the Marathon Training Team coaches encouraged us to do was to write down our race experience soon after the race because it would fade quickly. Nothing I write down could do the event justice, but maybe my words here will help me hold on to those little moments that were so special. I have been building this write up for a few days. Saturday morning was cold and dark to start, and it never really would warm up, but it did turn out to be a perfectly blue, crisp, bright autumn day. Byram dropped me near the Capitol a little after 6:30 and I watched as the sun rose slowly over the City. The training teams all gathered for a chaotic photo on the Capitol steps and then we disbanded into our smaller units. I joined Team Pink Nation for our final Benediction. Coach Blair spoke briefly, but focused on the gratitude we should feel to even have this opportunity. Not everyone gets to do this. Running 26 miles is a privilege. They say over and over to never do anything different on race day than you did on your longest training run. Well, that was problematic; my 20 miler was run with temperatures in the 70s. 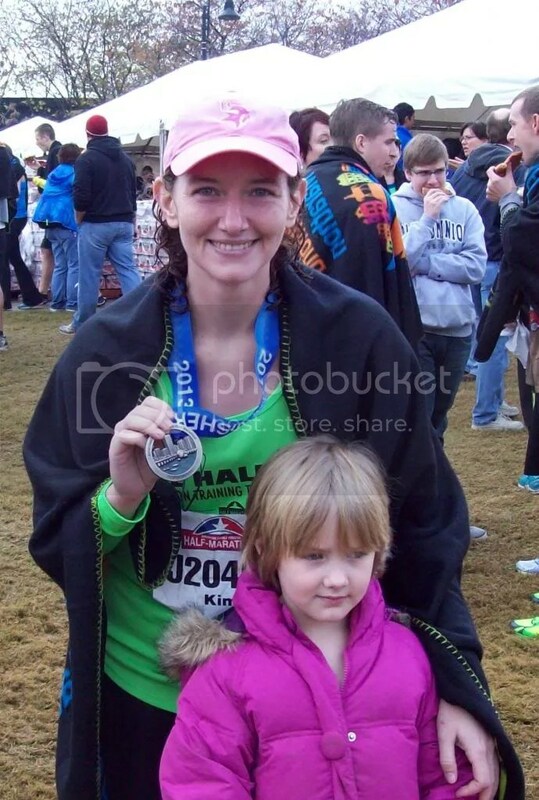 The Richmond Marathon coincided with our first “Arctic Blast” this year and it was 29 at 6:30 that morning. I had “charity” clothing to shed at the starting line, but I wouldn’t be able to run just wearing my team singlet. My arm warmers disappeared, so I decided the night before to wear my long sleeved technical fiber shirt, with the singlet over it. Another benefit of running with MTT was the clothing drop station they had at Mile 2, so I wore my running jacket for the first 2 miles without having to worry about donating a not cheaply replaced article of clothing. I also purchased a pair of $2 throw away gloves at the Expo with the intention of shedding them once I was warmed up. I was warm enough while waiting for the race to start, except for frozen toes. Nothing to be done for that and my toes did warm up eventually. I was concerned that I would wind up too warm at some point during the day and would have to lose the green long sleeved shirt, but that never happened. In fact, I never shed the gloves either. The only times I felt nice and warm were when I was in the sun. It was really cold in the shade all day long. So the race itself. I found Pink coaches and some ladies I knew who ran a pace I wanted (I was looking for 12:00 min/mile averages for the start). I introduced myself and we all ran together for the first 4 miles, at which point Coach Judy had to peel off to meet us later on Forest Hill Avenue. MTT coaches are spread out throughout the course to keep an eye on the team and give encouragement where necessary. This is why you wear the team shirt on race day, so you can be identified and assisted as needed. The first 2 miles are so boring but it was nice to have company and chat along the way. There were some good signs, and lots of spectators. I have run the Half twice now, but this was the first time I have ever turned Left on the Boulevard, not Right, like the Half route. It was kind of cool to make that turn away from what is familiar. I shed my jacket as planned at the clothes drop and the next two miles were spent still chatting with the other ladies. After Coach Judy departed at mile 4, the group I was with began dispersing. It was time to run Our race. Now the first memorable moment occurred around mile 4.5. We had just made the turn from Westmoreland Street onto Grove Avenue, where there was a huge cheering section and a lot of familiar faces from MTT in the crowd. They were giving high fives and I was taking them, and smiling and enjoying the moment when I saw a familiar face who is NOT associated with MTT. He was giving out high fives and cheering the racers, and you bet I got a high five. That was a pretty cool moment. That excitement carried me along Grove. At the Starbucks near Libbie, I saw a coworker who I thought had been in the race, but he was drinking coffee and cheering us on. I don’t know why I thought he was racing, but he wasn’t. It was cool to see a familiar face and he cheered me on. We then turned onto the only portion of the course that I had never run on before; Maple to Cary Street. This was a nice downhill area for the most part and it was nice to see a new-to-me part of town (from on foot, anyway). The party zone before the Huguenot Bridge was fun, but I was gearing myself up for the Bridge. Now, I like the Huguenot Bridge as much as I dislike the Lee Bridge. It was beautiful crossing the River and most importantly, there was no shade and the sun was nice and warm. It was picture perfect. And it was the only spot on the course where I made a minor mistake. I had been trying to cut the corners (or vectors) and was positioning myself on the route to stick tight to turns and I had assumed that we would follow the right side ramp off of the Bridge and down onto Riverside Drive, so I ran on the right side of the Bridge. Only to discover that the route took us down the ramp on the left side of the Bridge. Not a huge deal, but I essentially ran across all 4 lanes of Huguenot Bridge twice. Oops. Riverside Drive is hands down the most beautiful part of the course. I hit 8 miles just at the end of the ramp and took my first GU as planned. I felt amazing. I know this will sound a little silly, but at one point, a perfect yellow maple leaf fell from a tree, and it landed perfectly in my right hand; I didn’t see it coming until it was in my hand. It was really pretty and I considered keeping the leaf for a moment. Then decide that was a little crazy and I let it fall. Things were going well. I felt good. I had to stop at a little blue house for a few minutes just beyond Mile Marker 10. I suppose that meant I was well hydrated, but I hated losing those 3 or 4 minutes. I don’t mind admitting that I walked the steepest hills coming up and away from the River. I knew that Forest Hill Avenue was next and I wanted a little gas in the tank for that portion of the route. At that point I started seeing my coaches; Coach Blair checked on me and I told him I was doing great and he gave me a thumbs up and went to check on other runners. There was a really awesome party zone at Forest Hill and Westover Hills Avenues. The crowd was really cool and lots of people were cheering me by my name (on my bib). I was really pumped up through that crowd. I took my next GU as planned at Mile 14, just past Crossroads Coffee. The Lee Bridge was approaching and I knew I would need the energy. There were fire fighters out cheering for us in front of their station around 20th Street and Semmes. They were cool. The Lee Bridge was tough. It always is. I think it’s because we are headed north, and the wind there tends to be blowing straight into your face. Or it could be because right after the Bridge, everything is uphill for a while. It was tough and I pushed through it, happy to have that part behind me. Main Street was only interesting because of the seriously drunken spectators. I think they had been going at it since about the time the race started, and that was almost 4 hours ago. I wasn’t feeling as good or rational as I had been earlier in the morning so for some reason, these screaming drunk spectators annoyed me. At Mile 19, in front of The Diamond, Team Pink had a table set up. I didn’t want any food or water and I didn’t see any familiar faces, so I skipped it. I was not feeling very stellar anymore. At Mile 20, I took my 3rd and final GU and that didn’t go especially well. It had gotten cold and thickened up and it was hard to swallow and didn’t feel like it would stay down. It was also time to put in my call to Byram so he could start heading downtown. I made the call and as soon as he answered, I completely choked up. I couldn’t breathe properly, couldn’t really speak to him, and a little ball of panic formed in my midsection. I struggled as he tried to talk me through it, but hung up as soon as I could. I focused on my breathing and forcing my shoulders to relax and let go and very soon, I was feeling much better as the GU kicked in and the panic faded out. I called him back a mile later to reassure him I was actually fine and just had a moment there when it wasn’t all fine. And honestly, I really was fine. Yes, everything hurt but the hurting was increasingly unimportant to me. Somewhere on Brook Road, it really sank in that I was going to be alright. My right ankle was killing me but it wasn’t injured. My legs hurt but they didn’t feel heavy anymore, just sore, and sore wasn’t really a problem at that point. Still, I must not have looked like my finest when I approached the last half mile around Grace and 3rd Streets because an MTT coach that I didn’t know decided I needed company. She asked me questions and I answered, but I don’t remember either her queries or my responses. I know that the more I tried to speak, the harder it was to breathe, and the harder breathing came, the closer I pushed back towards that panic I felt near Mile 20. She stayed with me, which was probably good, but at Cary Street, I told her I was good and basically asked her to leave me alone to finish. That hill is both wonderful, in the sense that your effort level goes way down, and brutal, in the sense that your balance and energy levels are wrung out and just staying upright and not face planting is a legitimate worry. I didn’t have it in me to push more than the 9 min/mile pace I pulled out on that hill down to the finish mat. I tuned my ears in and listened. I was not in a crowd so if the announcers were still paying attention, I knew they would call my name as I crossed the finish. I crossed the line, made the final right hand curve onto Tredegar, and some really nice volunteer handed me my finisher’s medal, which felt shockingly heavy on my tired neck and shoulders. My phone was ringing in the pocket of my running tights. I couldn’t answer my grandmother’s call to surely see if I was okay. At that point, I was single-minded. I needed to find my Sherpa and get some more clothes on. I also really, REALLY, wanted a slice of cold pizza, but, well, pizza is for runners who manage to run faster than 12:30 minute miles. I found Byram who gave me a hug that actually hurt (my whole body hurt by that point) and we found my discarded running jacket in the clothing pile. I signed out on my team sheet, and then, careful not to trip and fall into the canal, I pulled on my extra clothes, posed for a few photos, and unceremoniously made our way back to the van and to home. It was over. I can call myself a marathoner. I was so cold when I got home that I couldn’t stop shivering and my lips were a deep shade of purple. I took a long hot bath, but kept having to add hot water because my skin was chilling the water around me. I was literally behaving like a human ice cube. I thought the medal would mean more to me, but it is just a thing to wind up in the pile of medals in my underwear drawer. My memory of my high five from Bart Yasso, the maple leaf in my hand, and running backwards to give a very small boy the high five he ran into the street to give me; these memories mean so much more to me than that medal. Calling Byram the second time to reassure him that I was really okay is so much more important. The conversation with the lady who was running her 7th marathon where she confirmed that I was feeling awful but normal for that stage of the race. The random chatter with Coach Judy. The sight of Coach Blair on Forest Hill, and knowing I didn’t need his assistance. The seemingly naked dude holding a sign on Riverside and Lookout. The incredible feeling of invincibility I felt around mile 12 on Forest Hill, spreading my arms out wide and wanting to yell out loud. These are the things I want so desperately to hold on to. These are the only reasons I would put myself through this again. No, the medal holds surprisingly little meaning to me. I don’t know. Training for this became a way of life for me, especially in the last month. I have so many other things in my life to devote time and energy to, but most do not hold the positive energies that running over 26 miles did. I think I would do it again. Maybe. The timing would have to be right. With that said, I loved the energy and the positivity connected with running with Team Pink (and Cocoa to some extent) and THAT is what I crave to have again. NOW I understand why some people sign up for MTT, fully intending to switch to the Half Marathon teams later in the season; it’s to surround yourself with positive energy and people who share the same, positive, connected goal that you do, as soon as possible. I have a couple of new goals for myself, none of which have to do with miles or speed. Once I tackle those, I might look at taking on another marathon. For now, I am content with what I have accomplished. So one of my favorite local breweries, Hardywood Park, decided to host a block party with a 4 mile cover charge. Ha. When we heard about this back in January, Byram and I knew we had to sign up; it was a great way to support the brewery, have a fun “date”, and you know, add 4 miles onto our weekly training logs. Now, I have done a few first timer races, and in my past experience, they are under-organized and confused events. Not for lack of trying, but I know from my own experience, organizing an event for a large number of people is a daunting task, requires experience, and ALWAYS suffers unforeseen difficulties. So my expectations for this race were a bit low. In fact, you could call me skeptical that this would go smoothly. I am so thrilled to say that Hardywood stepped up to the plate and knocked out a tremendously fun event with a limited number of wrinkles. They arranged for parking at the nearby baseball stadium, so there was plenty of easily accessed parking. We had done our part and picked up our packets the previous day, so we avoided that particular line. We also decided to leave work about an hour early so we got there with almost 2 hours until race time. That allowed us plenty of time to sample the Twilight Weiss they debuted last night for the race. With a fantastic beer and fantastic company, we enjoyed relaxing and conversing and just having a little grown up time. We ran into our friends Matt, Alicia, and Jennifer, and hung out with them as we waited to start. It was really nice seeing friendly faces. When it came time to go, Byram and I decided to line up at the back of the slowest running corral rather than with the walkers. It was so hard not to take off running as we crossed that starting line, but we stuck with the plan to get a good long warm up walk in. Post-race, we concluded that our warm up walk was a bit too long, but that is a good thing to learn. We started running around the 1 mile mark or shortly thereafter. Byram pulled up with a fortunately short-lived Charlie horse in that first run, but I think we were sort of jazzed and ready to run and took off at too fast a pace. He worked the cramp out and we slowed the pace down and got to work. Rather than base his running intervals on the watch, he chose to use music, and that seemed to work very well. I know the race was a tremendous inconvenience to those people who had to travel around the City last night, but it was a beautiful part of the Fan to run in, it was lovely waving at residents who were spectating from their porches and cheering us on, and really, we could not have asked for more perfect conditions. It was cool, but not so cold as to freeze us after the race, low humidity, and a gorgeous clear sky that was later lit up by one of the most beautiful full moons I have ever seen. We finished the race strong and Byram earned a new personal record, pulling 7 full minutes off his last 4 mile race time, and we finished in under an hour. The race photographer got a good picture of us grinning at each other as we were running to the finish line. I spotted her and told him to make sure he looked cute since we were getting our picture taken. He responded with something pithy and sarcastic, and so we were laughing at each other when she got us. That picture now graces my computer screen as wallpaper. It took almost as long to get our free post-race beer as it did to run the race, but it didn’t feel too onerous. I spotted a coworker who had come out for beer and the party, so we chatted briefly with him, and eventually got our Twilight beers and headed around a corner and out of the sea of people. It was the most fun I have had at a race. I went with low expectations and no goal other than to encourage Byram and enjoy his company, and my expectations were blown away and I solidly met both of my goals. My favorite memories of the event will be some of the cute signs held by volunteers for the race (“Take your time, we ran out of beer!” followed by “Just kidding!”), seeing the guy who lapped us before we had hit the 1 mile mark while he was on his way to win the race, cheering for a mom and her young son (maybe 4 years old) who were running a bit, seeing that clock read 58 minutes as we closed in on it, and crossing the finish line right next to my best friend. I hope Hardywood can do it again next year. If they do, I’ll be there.